Wednesday September 14th 1892 We were busy about the work all forenoon. We had dinner by half past eleven and started to the fair. There was a very large crowd on the grounds. It was nearly six oclock when we got home. It was two years today since Grand Mother died. Thursday September 15th 1892 We were busy with the work in the forenoon and after an early dinner went to the fair again. We took Hattie both days. It was six oclock before we left the grounds to come home. It took till late to do up the work. Mother got the premium on her bread. It was eight years today since Rob died. Friday September 16th 1892 We were busy about the work all the forenoon. Soon after dinner Mother and I went to town in the buggy. we were at Hatties awhile and up town to get a lot of things. We come home about four oclock took things out of the buggy them went on down to Robinsons to call. I picked the tomatoes and pickles after we got home. Saturday September 17th 1892 We got through with our work in time to go to town about two colock. The girls were ready to make calls so we drove on up to the cemetery and stopped at the office when we came back. It was night when we got our supper over. Sunday September 18th 1892 Will took me to church this morning. Mother had dinner ready when we got home. The folks were all over for the afternoon. We read and talked on the porch. I read a little in the evening. 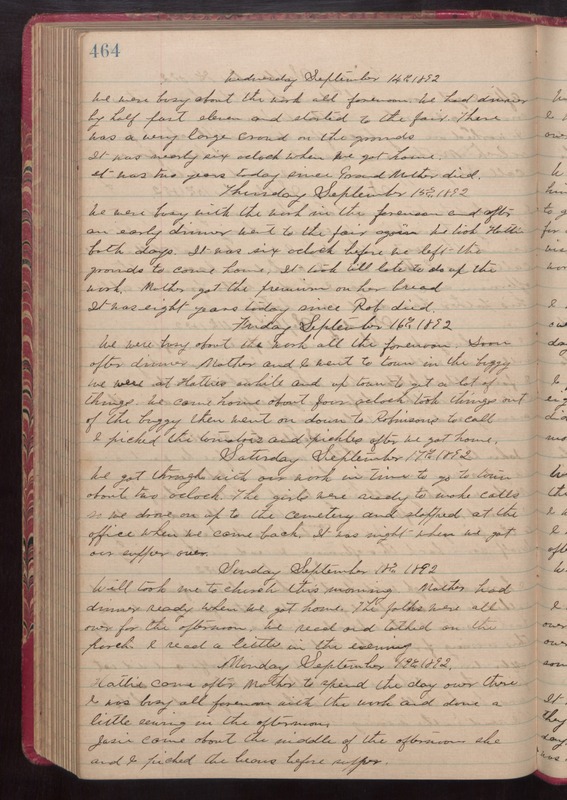 Monday September 19th 1892 Hattie came after Mother to spend the day over there. I was busy all forenoon with the work and done a little sewing in the afternoon. Josie came about the middle of the afternoon. She and I picked the beans before supper.